Maybe you have downloaded a movie from Netflix onto your PC and now want to watch it on your large TV, or maybe you want to show your recent holiday photos to your family by projecting your Windows 10 laptop screen to the TV. There are quite a few ways out there to connect your Windows 10 laptop to a TV. You can use cables to connect your laptop to TV but why use cables when you can wirelessly connect your Windows 10 laptop to TV. All you need to make sure is that your laptop and TV both support the popular Miracast standard. For those who don’t know, Miracast is a wireless technology using which your PC can wirelessly project the PC’s screen to a TV or display that supports Miracast. You can refer to our how to check if your Windows 10 laptop supports Miracast guide for directions. To check the same on TV, please refer to your TV’s manual or contact the manufacturer. 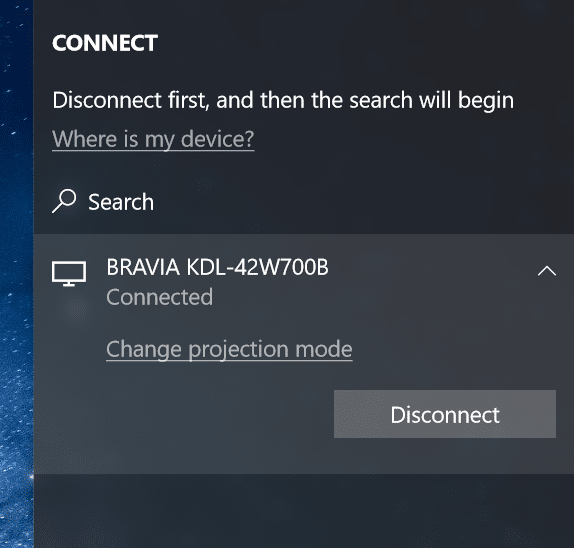 Complete the directions given below to wirelessly connect your Windows 10 laptop to TV. Step 1: Turn on your TV and make sure that its Wi-Fi is turned on. You can navigate to your TV’s settings to check if the Wi-Fi is turned on. Step 2: On your Windows 10 laptop or tablet, navigate to Settings app > System > Display. Step 3: In the Multiple displays section, click Connect to a wirelessly display link. 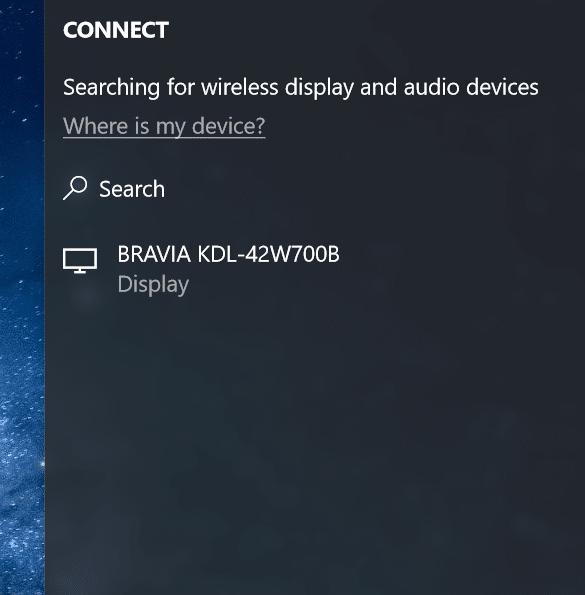 Windows 10 will now start searching for all wireless devices available and list them in the newly opened Connect pane. NOTE: If the Connect to a wireless display link is missing, it’s likely because your device doesn’t support Miracast or the required drivers are not installed. 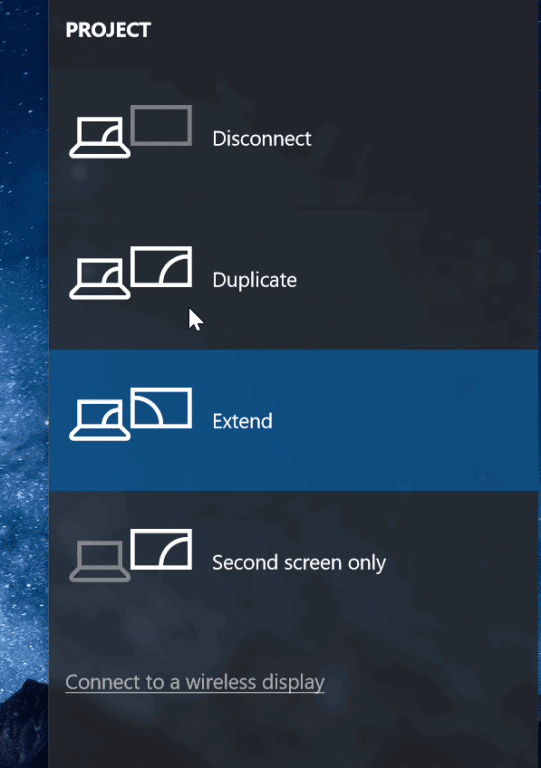 Step 4: Once your TV’s entry appears in the list, click on it to wirelessly connect your Windows 10 laptop to your TV. 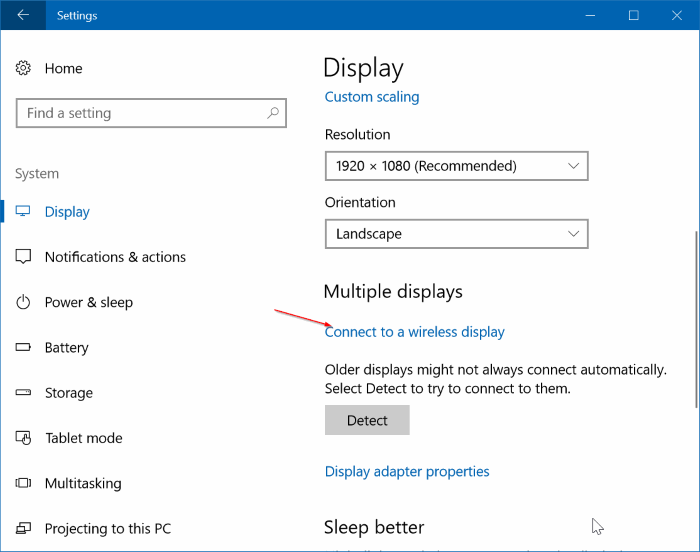 If Windows 10 could not find your display, click the Detect button in the Multiple displays section. 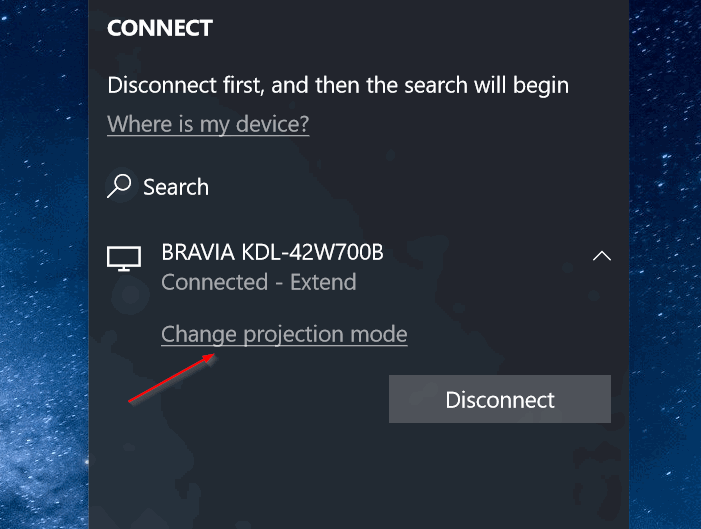 By default, when you connect your laptop to TV or external display, Windows 10 uses the last used projection mode. That is, for instance, if you previously used the TV to extend your laptop’s screen, then Windows 10 automatically uses the TV as the extended display upon connecting to it. If you want to use only the TV’s screen or change the default projection mode, you can do so by changing projection mode settings. Here is how to do that. Step 1: Navigate to Settings > System > Display, and click Connect to wireless display link to see the Connect pane. Step 2: Click on Change projection mode to select a projection type from Duplicate, Extend and Second screen only modes. Alternatively, you can use the Windows logo + P to open the Project pane and select a mode. Step 1: Navigate to Settings app > System > Display. Step 2: Click Connect to a Wireless display link to reveal the Connect pane. Click Disconnect to disconnect your laptop from the TV or display. Alternatively, open the Connect pane by simultaneously pressing Windows logo and P keys, and then click Disconnect to disconnect your laptop from the TV.